Q & A: What’s the best way to learn to carry a passenger? 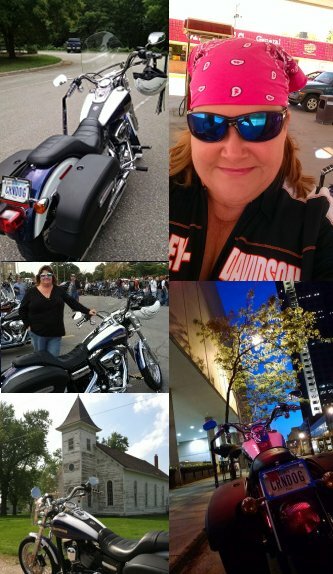 I’m a biker chick but neither my husband nor my son rides. I’d like to learn to take a passenger, but I don’t know how to do it. Does the passenger get on first? Where do they hold on? Can a 10-year-old be a passenger on a bike? Help! It’s important for me to start by saying that I have never taken a passenger on my bike. Inexperience aside, there are a few things that I believe I have “learned” by listening to others and thinking through what they’ve said, and by being a passenger for many years on my husband’s bike. I believe the best way for a passenger to mount the bike is to wait until you have mounted and have the bike pulled upright and properly balanced. You should have both feet on the ground and the handlebars straight. Then tell them it’s okay to climb on: put one foot on the left side peg and hold onto your shoulder, then push themselves up and swing their leg over the back of the bike. Get seated and make sure they find both foot pegs. If the bike has been running, be sure they don’t touch the hot pipes. They should, of course, be wearing long pants, socks and sturdy shoes. In dismounting, you should have the bike at a complete stop, balanced in an upright position or possibly with the kickstand down, whichever feels safest to you and your passenger. They need to remember that sudden movements will throw off the bike’s balance and could result in you losing control. They should always hang on to you, especially if there is no backrest. It’s preferable that they ride with their arms around your waist if there is no backrest. The other option is to hook their fingers through your belt loops, assuming you have any – but certainly this won’t give them as good a “grip”. 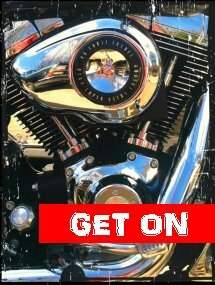 They could also reach around behind and hold onto the sissy bar if you have one. In my opinion, a backrest for the passenger is really a must – especially for a child. I used to get really nervous about my daughter riding with my husband on his old bike which had no backrest, because it just looked to me like she could fall off very easily, especially when taking off from a stop, and especially because he is a big guy and she could not even come close to getting her arms around him. Regarding handling curves: it will be natural for the passenger at first to try to “help keep the bike upright” when you go into a curve by leaning away from the direction of the curve, because they subconsciously feel the bike is going to tip over. But, by leaning away from the curve they are making it more difficult for you to complete the turn because they are “fighting” the lean of the bike. Tell your passenger not to try to actually *lean* one way or the other – just turn their head so they are looking over the driver’s shoulder in the direction of the turn, and that will redistribute their weight sufficiently to help the bike around the turn. Finally, carrying a passenger really DOES change the feel of the bike, so you need to practice in a parking lot with a willing adult before you hit the streets. That way you’ll get used to the additional weight without encountering other traffic.